In Canada, a Singapore company has signed a Letter of Intent with the government of British Columbia to build a gas liquefaction and export facility, to be the first LNG export terminal on the British Columbia coastline, at Squamish, northeast of Vancouver. The facility, which would export about 2 million tons of LNG annually, is just one of 13 natural gas liquefaction and export terminals proposed for British Columbia. ILWU Canada stands to add hundreds of new jobs in the process. Stateside, a joint-venture in Washington between Tesoro Petroleum and supply chain management company Savage Services to construct a new crude oil transshipment center has been delayed as the two firms wait for the State of Washington to provide them with requirements for an environmental impact study. With the bureaucratic delay, the cost of the terminal, expected to handle around 300,000 barrels of crude per day moving between rail and ship, is expected to increase from from an initial estimate of $100 million to as much as $190 million. In April of 2005, the port of Prince Rupert, BC announced it would develop an intermodal container terminal to compete with US West Coast terminals. Less than three years later, with a capacity of 500,000 TEUs and full on-dock rail, the terminal’s first phase opened for business with the arrival of the 5,400-TEU COSCO Antwerp and the addition of 900 new jobs. The Port of Los Angeles, by comparison, just recently finished deepening its main channel to a 53-foot depth – a project that was started more than 15 years ago, and posted a final cost of a whopping $370 million. Even in the face of increasing competition from our neighbors to the north, progress at US West Coast ports continues to be mired and wrapped up in red tape and stifled by the endless environmental review process, which adds years of busywork to even the most mundane development project. 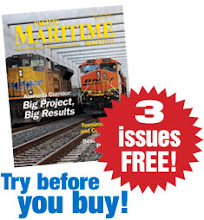 As noted in this issue, the Gulf Coast ports are gearing up for the inevitable market uptick, as are East Coast ports. At press time the US House of Representatives had just passed legislation authorizing the deepening of the Port of Savannah, Georgia, by a vote of 412 to 4. Georgia Governor Nathan Deal and the State General Assembly have committed $266 million to the project, only awaiting congressional authorization to begin construction. The project would deepen the Savannah River from 42 feet to 47 feet, to accommodate larger container ships expected to call from Asia through the Panama Canal, and in February of 2016, the Port of Savannah will take delivery of four additional super post-Panamax container cranes and 20 new rubber tire gantry cranes – an $86 million order. This will give the Georgia Port Authority a total of 20 super post-Panamax cranes and nine post-Panamax cranes. While our competitors move forward into the 21st century with terminal expansion projects, we on the West Coast continue to face endless environmental nuisance suits, redundant permit requirements and miles of red tape costing the US West Coast its competitive advantage – and jobs. Last month, contract negotiations began between West Coast longshoremen and waterfront employers in advance of the July 1 contract deadline. ILWU sources say the most important issue unions face today is retention of jurisdiction as automation eliminates jobs. That may be, but automation won’t be the reason waterfront jobs are lost to more efficient ports. These contract negotiations would be a good opportunity for West Coast employers and West Coast labor to show solidarity of purpose by calling attention to the stifling gridlock of red tape, and pledge together to hold their elected representatives responsible for the bureaucratic dysfunction that’s hurting West Coast port competitiveness.